Publishers using Adobe Dynamic Tag Management (DTM) can easily deploy Cookiebot to their websites with DTM by following these step-by-step instructions. We assume that you have already created a DTM account, created a property for your website in DTM and embedded the DTM header and footer codes in your website. 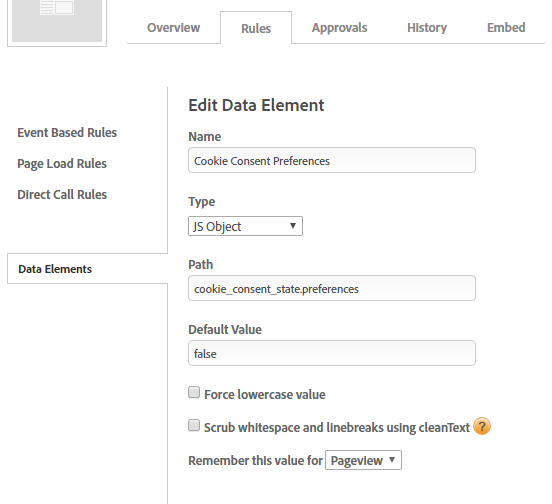 First, create the data elements which are the glue between Cookiebot and DTM event handling. From your DTM property click the “Rules” tab, then the sub-tab “Data Elements” and finally the button “Create New Data Element”. For all three Data Elements, select “JS Object” as type, “false” as Default Value and “Pageview” for persistence. 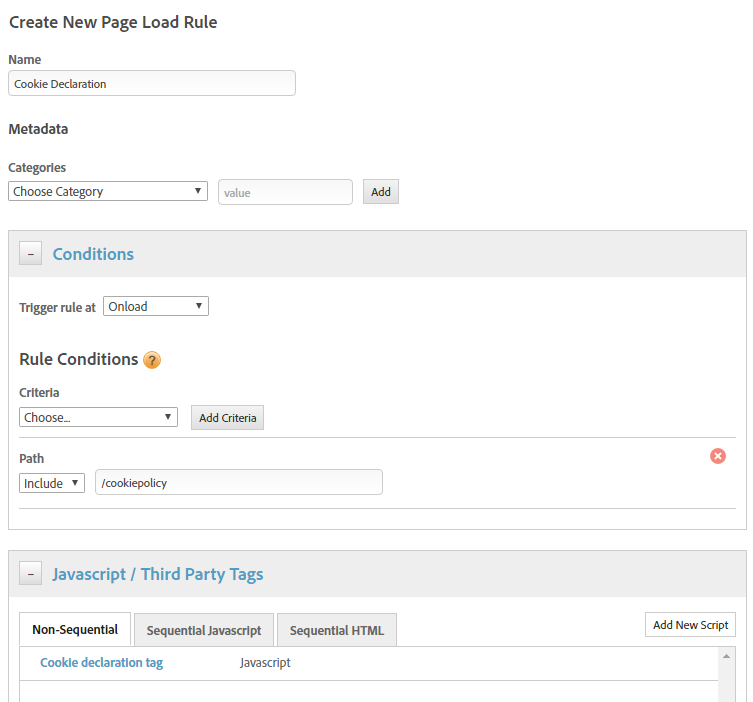 Now, click the “Page Load Rules” sub-tab to create a rule to include the Cookiebot tag on all pages. Replace the cbid-identifier value "00000000-0000-0000-0000-000000000000" in the code with your own ID from the "Your scripts" tab in the Cookiebot Manager. At the same time, make sure to enable Cookiebot on your website by registering the domain name(s) of your website(s) in Cookiebot. 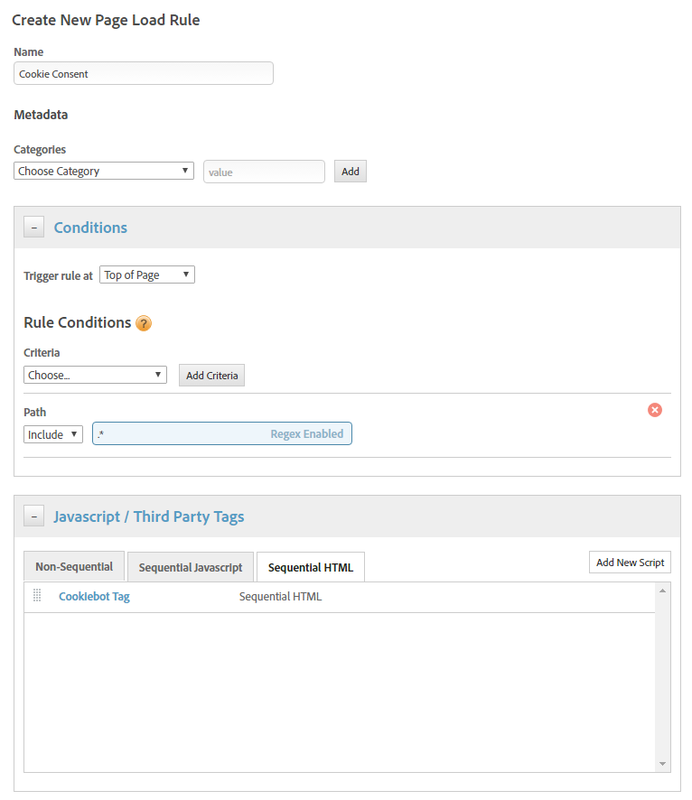 Finally, approve and publish your changes for the consent banner to display on your website. To comply with the visitor's cookie consent, you need to define the logic which controls the behavior of cookie-setting scripts on your website. Cookiebot exposes a client side object named "Cookiebot" which you can reference in DTM to check which types of cookies the visitor accepts (the visitor's consent state). For a full overview of the Cookiebot API, please visit https://www.cookiebot.com/goto/developer. In this example, we will show you how to implement and control the Google AdSense tag with Cookiebot in DTM, so that AdSense will only fire if the visitor has accepted marketing cookies. Since DTM loads asynchronously, we will use the async version of the AdSense script. 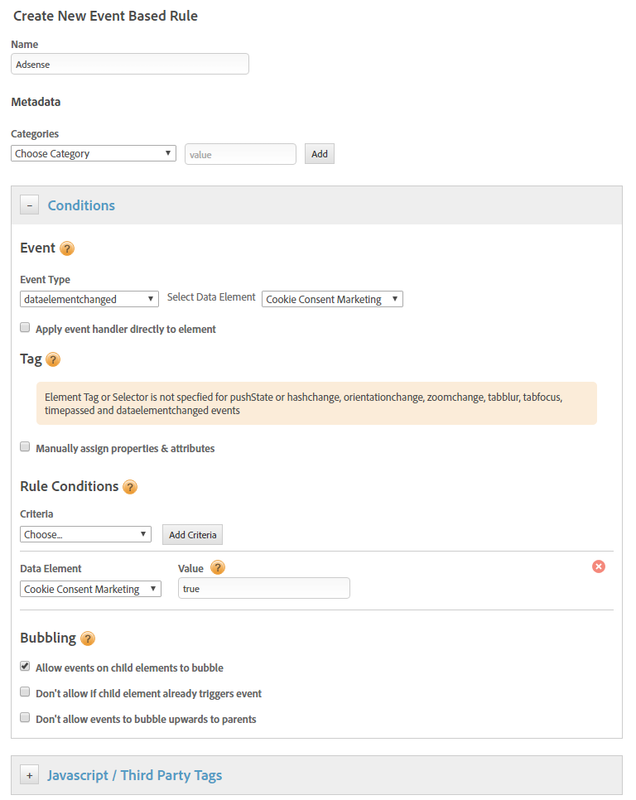 In DTM, click the sub-tab “Event Based Rules” and “Create New Rule”. Save the rule. When you approve and publish this rule, Adsense will only trigger for website visitors who has opted in for marketing cookies. First you need to create a new rule with the URL path to the page in question, e.g. "/privacypolicy". Replace the identifier value "00000000-0000-0000-0000-000000000000" in the code with your own ID from the "Your scripts" tab in the Cookiebot Manager. Also, remember to replace the class name "body-content" with the class name of the empty HTML placeholder element on your website. Finally, approve and publish to push the changes to your site. The cookie declaration will now display in the page element with the class “body-content” at the url path you have defined above.